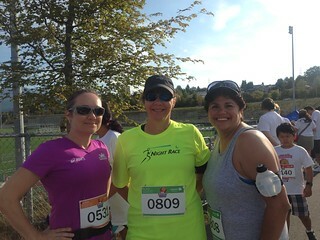 Except that I didn’t really go to the race to kickass. Because I was really there for donuts. And cotton candy. And a race medal with an adorable running donut on it. 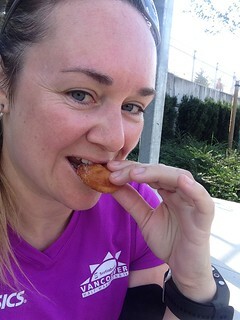 Before the race, I wasn’t too sure about the idea of eating a donut in the middle of a run – I find it hard enough to stomach my electrolyte/fuel gummies on a run, let alone having a pile of deep-fried dough in my belly, so I probably shouldn’t complain that there wasn’t a tonne of treats on the race course. Actually, if anything, what they really needed more of was water stations on the route – given that we are in the midst of a summer-long heat wave here in Vancouver, a single water station on a 5 km route was definitely not sufficient. I thought I was maybe going overboard bringing my water bottle belt on a mere 5 km run, but in retrospect I was quite glad I did! The race started on a track at Empire Field, but you quickly veered off that and onto a pathway, and then it was off through the park. I was originally hemming and hawing about whether I was going to run by myself at a fast pace or run with my friends who were planning on a slower pace with some walk breaks. In the end, I choose the latter and I was glad I did because not only is it nice to hang out with friends, but there were apparently 1300 runners in the race and the pathway was quite narrow for the entire route, so I think if I’d tried to run at a faster pace, I’d have been frustrated the entire time being stuck behind slower runners and walkers. It was kind of fun running through the park – I haven’t been to the PNE in ages, so it was neat to see the different booths and rides and games and dinosaurs. Because there are dinosaurs there apparently. There were also bunch of kids dressed up as pirates and mermaids and some sort of showgirl-type thing but with hot pink Converse hightops, all of whom were ready and willing to high-five the passing runners. Somewhere around the middle of the race we finally reached our first treat station – cotton candy! There were people handing it out in plastic bags (see the photo) – I insisted on getting the blue cotton candy, which for some reason seemed much more rare than the pink. Then we didn’t see another treat station until the 4.4 km mark3, where we finally reached the mini-donuts, which were also being handed out in little bags4. And from there it was just over a 1/2 km that we had to carry our haul to the finish line, because seriously, who can eat a donut and also run? When we came to the finish line, I decided to go for a little “sprint”5. I passed a little boy who was maybe 6 or 7, who then decided he was going to race me! So he and I ran for the finish line and he actually veered at me to try to cut me off! Fortunately, despite being short, I still have significantly longer legs than a 6 or 7 year old and managed to get aside to avoid being run into but it only took a couple of strides to catch up and run alongside so that we ran across the finish line at the same time6. At the finish line, they were giving out the medals and all of the people holding medals at the start of the line had medals with red ribbons, but I could see the guy at the back had blue ribbons. So, because I do always like to be different, I bypassed all the medal giver-outers at the front and went to the last guy in line and asked for a blue one. I said “Does the blue ribbon mean anything?” and he just shook his head, and handed it to me. Then he ran off because he noticed the little boy who I’d crossed the finish line with had walked right past all the medal giver-outers without getting a medal. So the little boy also got a blue ribbon. 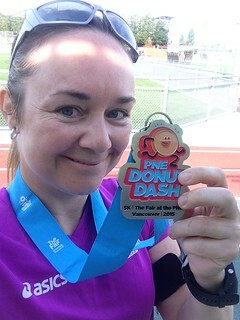 After the finish line, they had fancy mini-donuts – dipped in chocolate with sprinkles on them – that they were handing out one of to each runner. Sadly, they were a bit on the dry side and we honestly wondered if they were just day olds that they dressed up! 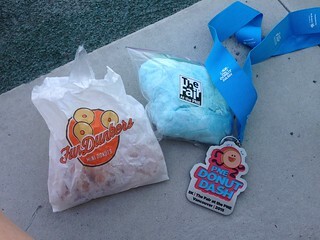 The sugar-covered mini-donuts that we were given along the race route were much better. Happily, the cotton candy was delicious! I’m sure it was because I insisted on getting the blue kind. All in all, it was a pretty fun time and I have now earned 3 medals towards my goal of earning 5 medals this year. Next up: Montreal half marathon – more than 4x the distance of today’s run and significantly fewer donuts expected… though I do plan to indulge in some poutine, a Montreal smoked meat sandwich, and some glorious, glorious spruce beer while I’m in Quebec – just not during the race!